Mike Carney, "Still (Real) LYF 38," 2017 paint, wood and volle, 54 x 84 x 1 1/2"
Mike Carney’s paintings and constructions of wood and voile challenge the way we look and see works of art. He studied at the School of the Art Institute of Chicago, where he completed an MFA in 2014. Since then he has rapidly been exhibited widely across the U.S., which has established him as an emerging artist to watch. This show features new work in the non-traditional materials Carney favors. These enable him to explore how images come to be and the illusion involved in translating from one medium to another. He is adept at depicting the same thing in a variety of ways, a type of translation that brings forth the new. The signature painting in this exhibition, "Still (Real) LYF 38," is inspired by, and based on, a still life in the collection of the Dallas Museum of Art by nineteenth-century American artist Severin Roesen (1816-after 1872), “Fruit Still Life with Champagne Bottle” (1848). The puzzle unfolds when it comes to light that Carney has never actually seen the painting. 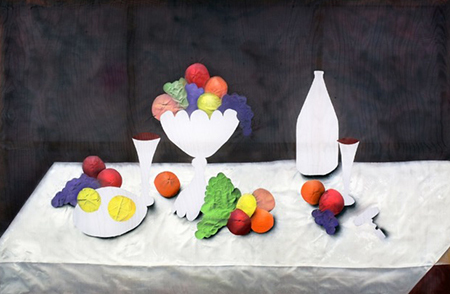 He began to create his version based on a photograph, subverting the original by painting on wood rather than canvas, or with the use of painted voile as collage elements that abstract the original imagery of fruits and other elements. A strong concentration of bright colors — purple, yellow, red, orange, and green — seem to explode, concentrated toward the center in a triangular formation. A space where the wood-grain comes through forms the background, while the still life arrangement shines atop a bright white tablecloth. The goblets and glassware are all whited out, reduced to blank cutout forms. Through an attention to detail and a keen sense of space, Carney’s vision problematizes the visual transformation of the reproduction of the painted image that he reinterprets. This is, after all, an image relying not on direct observation, but a reorganizing of information, space and time.